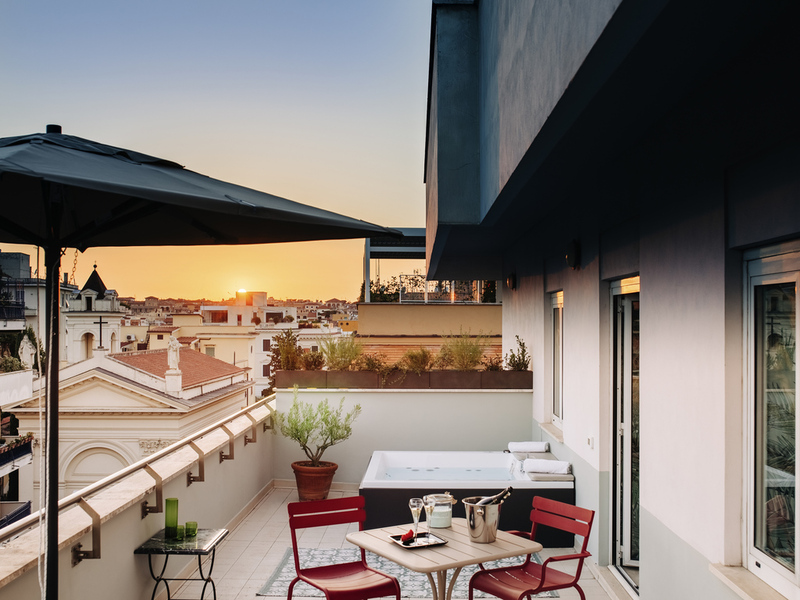 In the distinctive Coppedè area, the Mercure Rome Corso Trieste hotel gives a different view of the city, with its splendid terrace from which you can admire the architectural peculiarities and the unforgettable colors of the Roman sunset. From the metro (383 yards away), in a few minutes you can reach the historical center, the most famous tourist attractions and shopping area. Rooms (21 with a small balcony) with parquet floors and free WIFI. Services: Coppedè bar, fitness room and modular meeting room. The Mercure Rome Corso Trieste hotel is located in the prestigious Coppedè district, famous for its 1930s' villas and decorative architecture. The hotel is situated between two parks that are just a few minutes' walk away: Villa Ada and Villa Torlonia. Free WIFI. Bar open 7 days a week. Large terrace on the 7th floor: the perfect place for aperitifs, events and graduation parties. Fitness room and modular meeting area. Small pets allowed for a supplement. Friendly and professional staff. 97 rooms over 7 floors (5 floors are non-smoking), soundproofed, with wood floors, air conditioning, LCD TV with international channels, free WIFI, minibar, tea and coffee making facilities. If you want to treat yourself, try our Privilege Rooms, which offer you little VIP touches such as a minibar with complimentary water and soft drinks, a wide range of courtesy products, bathrobe and slippers, and Nespresso coffee machine. A contemporary lounge area where you can relax with a drink or enjoy a dish from the Les Purs Plaisirs menu. Our friendly staff are on hand to offer you gastronomic delicacies, finger food and much more. 46" LCD TV and Sky Calcio (soccer). Lovely room, very welcoming to us and our dog. Great breakfast buffet. Our room had a terrace with great views of Rome. It was a 20 minute walk to the centre of the city with lovely parks and cafes along the way, a favourite of ours was an ice cream shop where we became repeat customers. A hotel that has a good location to explore Rome, close to subway and some nice restaurants and cafes in the area. Clean and quite big rooms, at least if you take the larger rooms. Lack of power outlets by the beds is the only complain I had. This hotel is situated at a very quiet and not dangerous location. It is, however, not very far from the metro underground. Corad supermarket is only two blocks away.Staffs are very helpful and good at English. I have to give my sincere thanks to Mr. Boris Nanut, the FO manager, who very well understand the needs of the customers and can help me get rid of some problems during my stay at the hotel. I have to also give the credit to Mr. Andrea. I have very heavy luggage. It is impossible for me to go to the international airport by the metro underground. Calling a taxi might costed me about 65 euro. Mr. Andrea recommend me to use the service of the hotel service for 55 euro. I, therefore, can save my money and energy. All staff here are nice, helpful, and friendly.If I will have any chances to visit Rome again, I will also book this hotel again. His hotel is always quiet and discreet. Always immaculately clean with helpful, friendly staff and in a perfect location to visit my friend who lives nearby. It’s also close to the buses and the metro, so easy to get into the main city if necessary. We are overall satisfied with our stay - for this price range, everything went well. Nice and helpful staff. Bear in mind though that its location is not close to central Rome. There is a metro station nearby which takes you to central Rome within a few stops. It's an easy process and you can buy a one-way or a full-day ticket at the ticket machines at the nearest station which is quite cheap. The hotel "bar" (if you can call it that) is my only negative comment. It's just a small open area at the reception with a bar desk and it's really small, doesn't give that "bar" feeling.Also some minuses... We didn't have any body lotions in our bathroom which isn't something I'm used to. Schampoo (combined with conditioner) and a shower gel only... No iron in the room either.Despite these drawbacks, we had a good stay. Staff was really friendly and helpful.Rooms are quite small. But we were lucky as we were upgraded to a room with a balcony. Very warm welcome on arrival. Didn't get the chance to have our welcome drink but the room was very good. Although the hotel is not situated in a busy area, it took us less than 10 minutes to get to metro station and cafes. We are overall satisfied with our stay - for this price range, everything went well. Nice and helpful staff. Bear in mind though that its location is not close to central Rome. There is a metro station nearby which takes you to central Rome within a few stops. The hotel &quot;bar&quot; (if you can call it that) is my only negative comment. It's just a small open area at the reception with a bar desk and it's really small, doesn't give that &quot;bar&quot; feeling. Great position with large room and large bathroom. Helpful staff and clean. Beds are hard though. Nice location of the hotel. Good connection form/to the center with metro B1. Directly to Colosseo. Nice, clean rooms. Good breakfast. Hotel w ladnej okolicy. Dobry dojazd metrem B1 do/z Centrum. Pokoje czyste, ładne. Smaczne śniadanie. Our stay was most pleasant and comfortable, right from when we were greeted and checked-in by your very helpful reception staff to check-out, when they organised a taxi to take us to Fiumicino. Our room was comfortable, clean and spacious, with the added bonus of a small terrace. It was also very quiet, with neither ambient noise nor noise from fellow guests. The hotel is well located in a residential area within short walking distance of the metro and shops, trattorias, pasticcerias, pizzerias and all things that make visiting Italy so good. Your team provides 10/10 service and accommodates very well to requests. Will recommend this hotel in the future due to this.